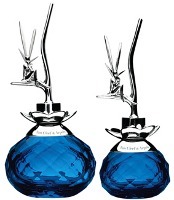 Féerie, by Van Cleef & Arpels features an unusual bottle design: the cap is metal (or metal-like?) and features a fairy sitting on a twig (it was inspired by their Midsummer Night's Dream jewelry collection). From what I've read so far, it's probably shaping up to be one of those love-it-or-hate-it bottles, but my own initial reaction was ambivalent. After seeing it in person, however, I'm firmly in the hate-it camp. The blue glass bottle is pretty, but the "sculpture" on top just isn't as luxe as its price*, and it's all a bit twee for my taste — my taste, apparently, runs more towards plastic doll heads. Besides that, even the sales associate acknowledged that eventually, you're gonna poke your eye out with that thing. The scent, advertised as a woody floral violet by perfumer Antoine Maisondieu, started out difficult on paper: a screechingly-pitched blast of sweet berry over creamy-powdery violet (the notes: violet, red berries, mandarin, rose, jasmine, iris and vetiver). It gets nicer (and drier) soon enough, but it's markedly better on skin, where the top notes fade from cloying to merely sweet much faster, and the earthy base helps to balance it out. Eventually, Féerie is a good fit with the bottle: delicate, feminine, a bit fanciful. It's one of those scents that has the makings of something wonderful: there is just enough there to love that I found myself redesigning it in my head every time I wore it. As it stands, at a more reasonable price I'd think it a wearable if not dreadfully interesting department store entry, and hey, I wasn't expecting anything edgy from Van Cleef & Arpels anyway**. But the scent can't live up to the aspirational pricing any more than the bottle can, and the red lollipop opening, instantly recognizable if you've smelled any of the fruity florals marketed to 'tweens over the past few years, seems at odds with the luxury positioning. Van Cleef & Arpels Féerie is available in 50 ($110) and 100 ml ($150) Eau de Parfum, and is currently exclusive to Neiman Marcus. *As March pointed out at Perfume Posse, "it is primarily whimsical – but it should also look like it was issued by a venerable jeweler, not Avon". ** We've another chance for an edgy violet from perfumer Antoine Maisondieu this year: the new Comme des Garcons + Stephen Jones fragrance. It's already out at Dover Street Market, and I do wish one of you Londoners would go smell it and tell us how it is. It's even more expensive than the Féerie (around $140 for 55 ml at today's exchange rate), by the way. Awww…I like that bottle, R. It could double as a lethal weapon against an intruder…just poke the sucker's eyes out and dial 911, lol! Seriously, the juice is too sweet and too expensive, so too bad. However the CdG+Stephen Jones' fragrance sounds very, very interesting. The bottle and packaging is understated and inventive, too. Lots of people love that bottle, and since I bought the Harajuku Lovers I'm clearly disqualified as any kind of arbiter of taste, LOL.. The CdG might be my last great hope for the year…do hope it's wonderful! You are not kidding, R. The pickins' have not been the best, but I am still holding out for Dans Tes Bras, Sublime Balkiss, Prelude to Love and a couple others. VIolet and red berries… Hmmm sounds like the Guerlainade notes – Insolence, anyone? Ah, keep forgetting the FM! Prelude to Love is lovely. So true, and I should have thought to try them together! I'll have to do that later. But going off memory, I'd take Insolence over this, and really looking forward to trying the new Insolence EdP. I have not tried that in years, I should give it another go. I've really never found a perfect violet. The best bottle (IMO) is Truely. I think I will end up purchasing it. Isn't it $250? I really like the juice so it wouldn't be a waste…but who buys it? I keep thinking I will run into it at a discount. I've been lemming this one for the longest, if only just for the bottle….however, for $150 I want more than a 'red lollipop opening' although, the mid to base notes definitely sound worth a sniff. I came to decide that since I have a small child in the house who might see this on the dresser and deem it 'play worthy' because of the little fairy, it would be too dangerous. And, it's way too costly to have to store in an unseen, out-of-reach location. Thanks for the review! Actually I'm a loser and I do like to bottle! I think it looks gorgeous but not very convenient to carry in my purse anyways. Plus the price… gimme some L'Artisan Tea for Two or Serge Lutens for that price but I'm sorry not Van Cleef and Arpels. When I was young I would have thought it VERY play-worthy — yes, you'd have to keep it hidden! Ack! Someone's mentioned the Guerlain “I” word! I still can't get rid of that connection to the scent of bottled haircolor. OMG, EdP? I'm all for it if they kill the candied raspberries and up the ante on the Guerlinade. Interestingly, I actually do like the smell of My Insolence better. As for Feerie, the price is definitely feersome! I actually like the bottle. It's nice knowing that the look of luxe is back in focus. As for the juice, I think the violet is done much much better than Guerlain's offering. Worth a purchase if you can grab a bargain when it finally appears at an online perfume discounter. IMO, I think the smell of violet is better when they tone down the sweetness and amplify its drier, greener aspects. Feerie is warm, but luckily it doesn't remain sugary sweet as it develops. Very similar, but not as well constructed as Amethyste by Lalique, coincendently created by the same company that makes Feerie. 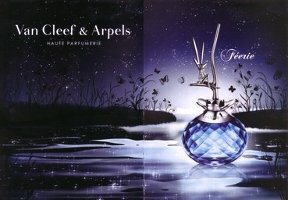 I like Feerie, I Idon't wear it much, but the bottle is eye candy. actually the fragrance is like a jolly rancher. Yummy until its gone. The top notes reminded me of hair spray, but I still liked it better than My Insolence — we'll see what they've done with the EdP. I haven't seen it anywhere yet. Yep, I'll second “jolly rancher”! I like the shape of this bottle! Look nice and charmed!!! That's another “yes” vote, thanks! I love this perfume…it is soft and sweet not loud…im allergic to some perfumes and when I tried this one from a friend I totally loved it…it is costly but it is worth it….buying cheap perfume I will sneeze my brain out….good perfumes are costly!!! what a cloying-escada’s sentiment-ished scent. put it in my pocket and I totally forgot them. Fruity- not fruity that I alway smell something more mature, I guess. And Finally I found that it’s Feerie ! So I tried to find it on E-BAY and I found one ! But I found it at $105 ! (3350 Bath) !! And bought it almost half price of my store ! Congrats — that’s a great bargain! I got this yesterday and all i can say is i’ll never buy something without smelling it first! I’m totally disapointed, it’s so light i can’t smell it and it doesn’t stay on me… at all. I thought it was me but others can’t smell it either. The only good thing is the bottle and it’s not worth the price only for the bottle. Aw, sorry! Maybe you can return it? and I love the bottle design, I would buy just for the bottle. and I’ve only ever smelled this by taking the top off and putting my nose to sprayer. so I don’t porperly know what this smells like. I’ll try it properly next time I’m in Harvey Nichols. it’s too bad they don’t do a 30ml edp. I smelled this in Debenhams today. it is nice, I see it as a fresh scent that has a bit of fruit and florals in it. it’s not strong but it’s long lasting. I took a whack at Feerie again today in Debenhams. and at first sniff I really liked it, I forgot I put it on and it kept reminding me it was there but I just couldn’t think what it was until I smelled my arm and remembered, it’s strength surprised me. it’s a lot stronger than I first thought. I can also smell more of it this time around, it’s incredibly pleasant, also smells to me of berries. but it’s still too expesive to buy a bottle, it’s £92 for 100ml in Harvey Nichols and that’s the only place I can find it. apart from the Debenhams store in White Rose shopping centre no other Debenhams has it!! not even online. I think the 50ml is £62 and there is no 30ml to my knowledge. it’s so darn expensive.